NEW! NEW DESIGN! VALENTINE'S DAY PIRATE CUSTOME! 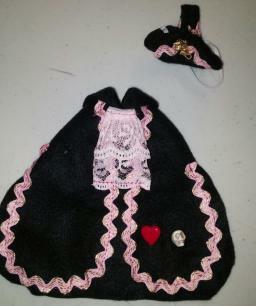 This little costume is adorable with a a Red Heart, a Skull Bead, Pink Lace at the collar,a PiRATe Captain's Hat with a Gold Colored Rat Charm. There is a lot of hand work in this outfit! The waist measurement on this PiRATe Captain Coat is approx 9", it does have a bit of stretch in it, and the outfit is approx 5" from neck to tail. 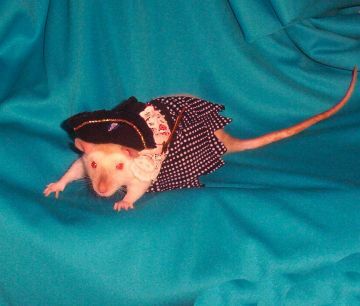 These items are new and have never been worn by or tried on by any rattie. But we did want to show off this photo of our nine week old Gypsy in her own PiRATe costume with sword! !